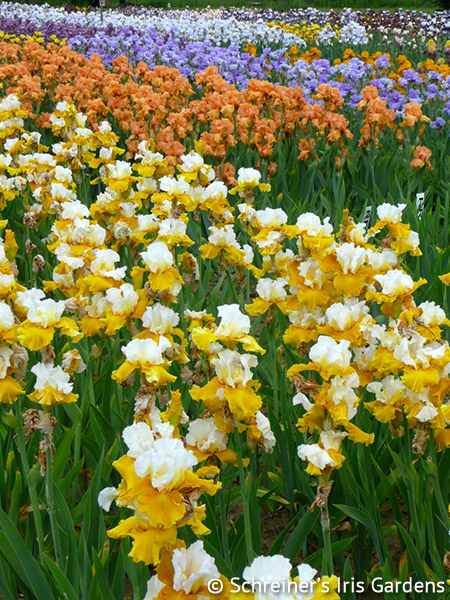 Iris Display Garden & Office: 3625 Quinaby Road NE in Salem, Oregon. Display Gardens are open to the public in the month of May 9:00 a.m. to 6:00 p.m.
Bloom season flower show, gift shop and plant sale are open daily in the month of May, 9:00 a.m. to 6:00 p.m. Parking $5 per car; $10 for buses. Office hours: Year-round Monday to Friday, 8:00 a.m. to 4:30 p.m. (Pacific Time). Phone: 503-393-3232 Closed all major holidays. Just 32 miles south of Portland and 5 miles north of downtown Salem, Schreiner's Iris Gardens is located at 3625 Quinaby Road NE in Salem, Oregon. 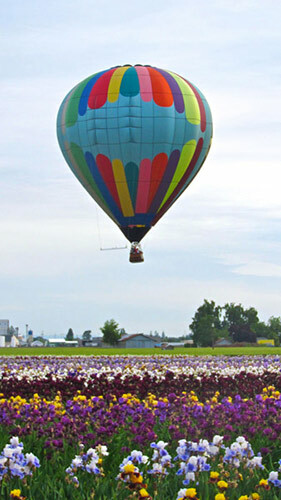 Learn more about visiting Salem and Oregon's beautiful Willamette Valley at Travel Salem. Tall Bearded Iris blooming in field, Salzburg Echo in foreground. From the North: take I-5 south to the Brooks exit 263. Go West (right turn) on Brooklake Road, turn left on River Road, travel for 1 mile, then turn left on Quinaby Road. From the South: Take I-5 North to the Brooks Exit 263. Go West (left turn) on Brooklake Road, turn left on River Road, travel for 1 mile, then turn left on Quinaby Road. Planning your Spring vacation? Looking for a lovely Mother's Day outing or a new picnic venue? Visit us during Bloom Season! Click here for more details.